1- it Will be able to take part in this certamenany woman greater artist of 18 years, resident to the Spanish State with independence of his place of origin. We do positive discrimination to put in value and give visibility the work of the women artists further of his artistic speech. 2- Each participant only will be able to present an only project, of what has to be author and proprietary. Has to present a specific project that has to answer to the characteristic of the place with an innovative proposal. 3- The project of artistic installation will have toadequar to the space proposed by the museum: scale of central snail (see images). Measures of the gap of the scale: 10 m of high x 2,5 m diameter. The museum has of some subjeccions to hang the work. The systems of subjecció would have to justify technically and in the budget. 4- The technical and thematic of the certamenis free, if well, the piece will have to encircle to the previously proposed space. It advises take into account the philosophy of the museum to realise the work, thus the artistic projects will not be able to go against of this. 5- will be able to visit the space expositiubefore submitting the project in order to adequar-it as much as possible, or consult the necessary doubts with the contact indicated. – Name, address, e-mail and telephone. – Photocopy of the DNI or passport of the author. – Address of the blog, web, or any one other link of the artist in case that have . – Specification of the title, technical, formed/approximate dimensions, technical needs and budget of material and setting to carry out it (maximum 2.000 €), outline, sketch/design of the setting. The budget has to include until 2.000 € of production (it is necessary to include; setting, desmuntatge, transfers, accommodation, material, system of subjecció, machinery if it is necessary , transport of the work and insurance). To the quanties has to include the taxes and retencions corresponding. – Conceptual description of the project of maximum 10 lines. 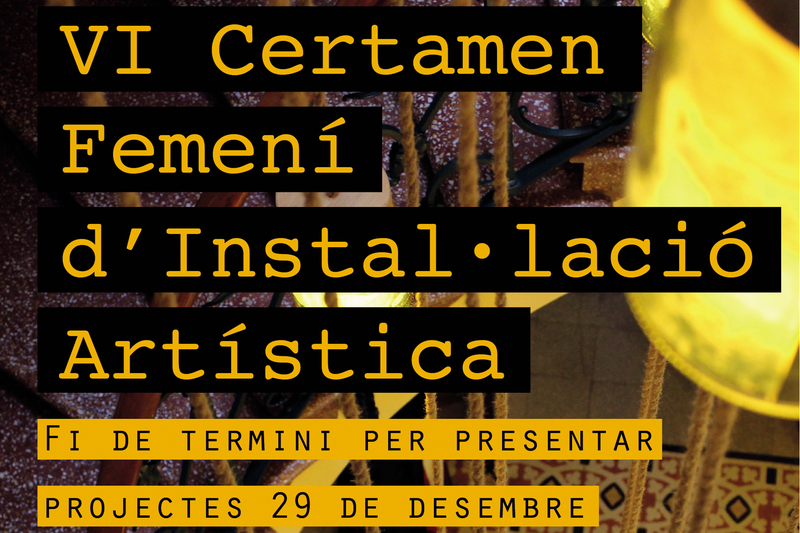 7- The fine of the term of delivery of the projects is day 29 of December of the 2018, in electronic format to museu@canprunera.net, in paper to Can Prunera Modernist Museum, Street Lluna 86 and 90, 07100 (Sóller), of Tuesday to Sunday, of 10.30 h to 18.00 h, or for post ordinari or for agency of transports to the same direction (the date of the handstamp will not be able to be back to the 29 of December). The public presentation of the work will be day 9 of March. For the presentation of projects via e-mail, only will be valid the once received participation an e-mail of confirmation of reception sent by the Organisation. If the participant did not receive post of answer, would have to contact with the Organisation to the 971 638 973, before the 18 h of the December 29, 2018. 8- In the case that send by means of agency of transport, will be it for account and risk of his authors, to carriage paid. The Foundation Train of the Art does not hold responsible of the deterioration of the works for inappropriate packaging. 9- Apart from the project, also will have to present a graphic dossier with a maximum of 10 of recent works, outlines or personal works realised by the author (until a maximum of 10 pages). The projects of new technologies will be able to go accompanied, besides, of an URL or an external link). 10- The Certamen Feminine of Artistic Installation, contemplates a prize endowed in 1.000 € (in quality of the honoraris of the artist: 80% in the acceptance of the prize and 20% when publish ) and in the execution of the work to the museum, in addition to the diffusion to press of the pertinent author and of all his bagatge artistic. 11- The jury of the contest will communicate the result to the rewarded personally and seguidament will make public the winning project. ‘Execution of the intervention s has to realise d agreement with the outline presented and validated by the Organisation. 12- So much the project like the winning work will remain in property of the artist although the Foundation Train of the Art, will be able to reproduce it in catalogues, flat web, networks, etc. Doing feature always the autoria of the work. 13- The jury will be formed by people related with the contemporary art and that they will be designated by the Foundation Train of the Art. The jury will complete with his criterion the doubts that could pose the interpretation of these bases and his decision will be unappealable. 14- The prize will be able to remain desert if the jury considers that the projects presented have the sufficient quality. 16- The participation in this certamen drives to the total acceptance of the present bases, as well as of the decisions that can take the organisation of expensive to the best development of this. (Without influencing in the content or shape of the work against the will of the artist).